Out of the Blue is a book by Jan Wong. Wong was a Globe and Mail reporter for about twenty years. Out of the Blue was a result of Wong’s experience regarding workplace depression due to a controversial article regarding Dawson College shooting. The article had suggested the shooting may have been linked to Quebec racism. Out of the Blue, depicts depression resulting from stress, racism, discrimination and abandonment. 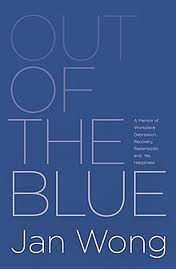 Out of the Blue describes the depression and mental hardship racism causes, it brings awareness to the psychological anguish racism causes. Out of the Blue is a testament to how self deteriorating workplace depression can be and how it can affect an individual’s life. Information on Out of the Blue and Jan Wong can be found on http://www.janwong.ca/outoftheblue.html.